Daimler makes all of its M-Class SUVs at the Alabama plant and ships them to markets around the world from there. FRANKFURT -- Daimler AG said it would invest more than $2 billion in its U.S. car plant in Tuscaloosa, Alabama, to build more M-Class SUVs. In a statement on Thursday, the maker of Mercedes-Benz cars did not say over what period it would invest the money. Daimler is investing heavily in production outside its German home market as it banks on growing demand for cars and trucks in North America and emerging markets. Last month, it said it signed a contract with Chinese joint venture partner BAIC to invest about 2 billion euros ($2.84 billion) in an engine plant in China. It also has a partnership with Russia's Kamaz and has announced it will add staff at its truck plants in North America and Brazil to meet growing demand. The plant in Tuscaloosa, which Daimler founded in 1995, has almost 3,000 workers and makes more than 90,000 vehicles a year. 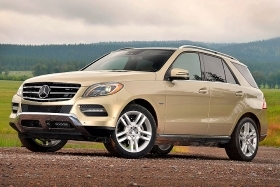 Daimler makes all of its M-, GL- and R-Class SUVs at the Tuscaloosa plant and ships them to markets around the world from there, according to its Web site. Starting in 2014, the plant will also make the successor generation of the current C-Class for the North American market.